The third week of January 2019 was another relatively quiet one in Iraq. There were few incidents, while casualties were up from the previous week. There were 27 incidents reported in Iraq from January 22-28. 5 of those were Turkish air strikes on northern Kurdistan. That left 22 attacks by the Islamic State. Diyala had the most incidents with 9 while there were only one each in Baghdad and Ninewa. There have been 20-30 incidents per week since the end of October 2017. That started the Islamic State’s hibernation during the winter. There were 36 deaths and 31 wounded during the week. 6 Iraqi Security Forces (ISF), 15 members of the Kurdistan Workers Party (PKK), and 15 civilians lost their lives. 1 Asayesh, 15 civilians and 15 ISF were injured as well. Salahaddin had 18 casualties with another 15 in Diyala. There were four incidents in Anbar. Those were all in the center spread from the Fallujah district to Haditha. In the later, IS executed two farmers, and kidnapped two others. The Islamic State has been relatively quiet in Anbar since the fall, but has been more active there this month. Baghdad is another province that IS has largely pulled back from. There was only one incident, which was a shooting in Abu Ghraib in the west. The capital used to be the main target for terrorist attacks, but that has not been true for more than a year now. Central Iraq is where the insurgency is rebuilding. In Diyala there were 9 incidents. That included a town being attacked in Jalawla in the northeast, an army base being hit by mortar fire, and two checkpoints attacked. 6 of those attacks happened in the Abu Saida area in the center-west. In previous weeks most incidents were occurring in Khanaqin in the northeast and Muqtadiya in the center. For example, an official noted that the militants were targeting checkpoints in both districts. Now however Abu Saida is blowing up. On January 22, a local official there said IS was using the area as a base. The next day the district head told the media most of the villages in the south like Mukhisa were under insurgent control and the security forces were constantly threatened. The Diyala police chief denied that claim, and yet on January 24 local residents started a two day sit-in protest over IS violence there. January 25 the head of the Abu Saida security committee reported that the ISF began cutting off roads and would be focusing upon Mukhisa and Abu Karma. That same day a Diyala parliamentarian appealed to the prime minister to secure the district, again naming Mukhisa. The fact that IS are hitting these areas consistently shows a new level of boldness for the insurgency there. 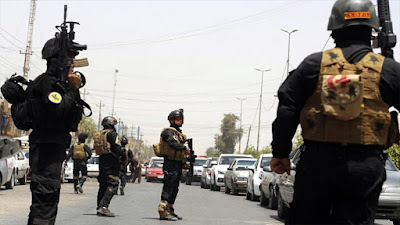 In Kirkuk, there were 3 incidents including two mukhtars who were kidnapped and freed by the security forces, and a suicide car bomb in Riyad in the south. That was the third vehicle bomb of the month. There was just one shooting in Ninewa. Finally, there were 4 incidents in Salahaddin. In Shirqat, IS laid an IED that hit a bus full of police. When other security elements arrived they were hit with a second explosion. In total, 3 police were killed, along with 1 civilian and 7 police and 5 civilians were injured. A Salahaddin councilman warned that the insurgents were still in the Hamrin Mountains that straddle the Salahaddin-Diyala border. This is one of the areas IS retreated to when the conventional war with the Iraqi government ended.